A catch-up dinner with my ex-housemate The Swan was in order after she came back from a year overseas which involved, in no particular order: midwifery in Peru, driving through red lights in Zimbabwe (so as not to get hijacked you understand) and random other hijinks through the rest of South America, the UK, the US and various festivals such as Carnavale in Brazil. As it’s hard for me to type tone into that factual recitation of destinations, let me just point out here, I’m insanely jealous of the year she had. We settled on Little Creatures because we had narrowed it down to the Brunswick Street area and one of my workmates said decisively, “well Little Creatures is the best place on Brunswick Street”. It had been on my wishlist for ages – was he correct? The space is awesome – large but comfortable, that cool distressed look with industrial-esque lamps hanging from the ceiling. Oh, and a bunch of bikes out the front that you can apparently borrow, because this is Fitzroy after all. We were seated in the smaller room at the front which was great for smaller groups and couples as the din is reduced. 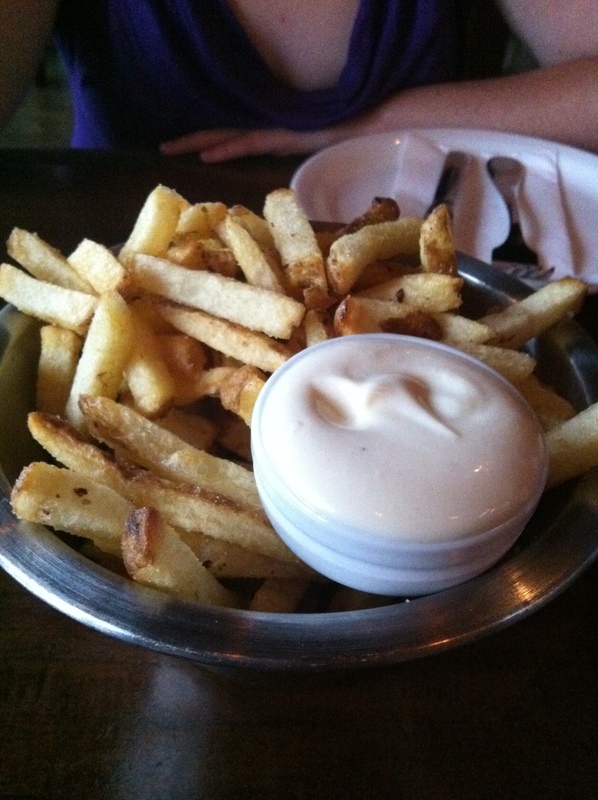 Personally, I had heard great things about the fresh cut chips with garlic aioli, so that was our first food order. Oh, I should point out before you see all the food we ate and shudder in shock – we were pretty ravenous this night. The chips were great. Crunchy, still had some skin on. And the garlic aioli, well. Looking at that photo is making my mouth water again. Smooth luscious garlic aioli. And chips, aka designated aioli to mouth conveyance. We then decided to split two pizzas. 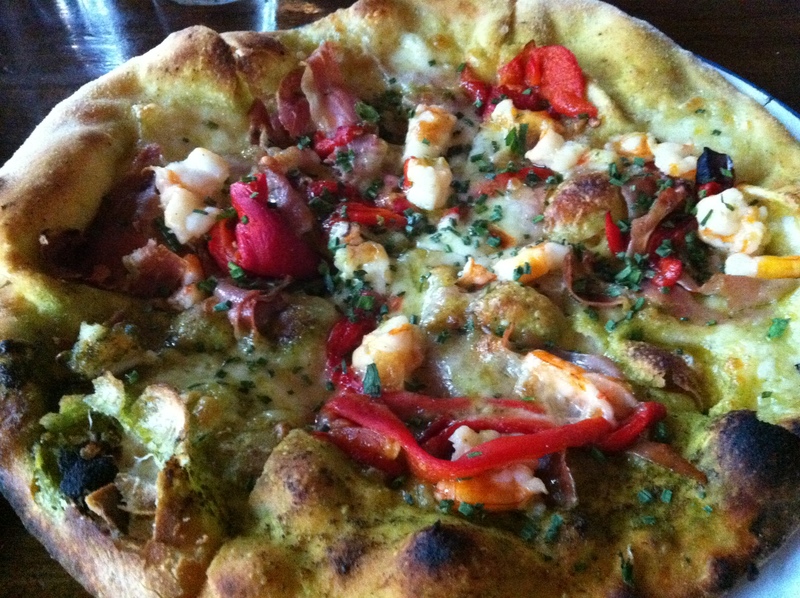 My pick was the prawn, prosciutto, salsa verde and mozzarella pizza; The Swan went with rocket, pear and gorgonzola. The menu spelled it “roquette” which I find a bit… pretentious. Nevertheless, the pizzas were highly enjoyable. The bases were both crispy and chewy, and the toppings were not too much, just enough – my favourite kind of pizza – and flavoursome. 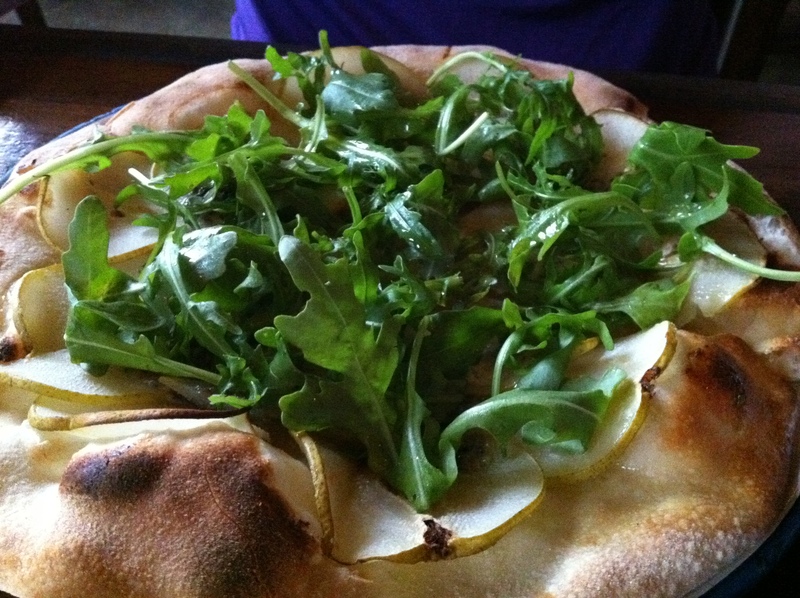 While this pizza may look like a pile of rocket, the pear and gorgonzola really made it. Check out the ample amounts of prawns and prosciutto. By this stage, I thought I was going to explode, but The Swan was enjoying the flavours and decided to get dessert as well (did I mention I probably ate 80% of the chips at the start while she was telling all her stories? Bad piggie friend!). I omitted to take a photo of her dessert (probably as the vast amounts of food had drained the blood from my brain to my stomach) but she said the apple pie with double cream was delicious. How could I have narrated the entire meal at a brewery dining hall and forgotten to mention the drinks we had? We both washed down our great meal with a pint of Little Creatures Pipsqueak apple cider each. It’s not my favourite cider ever, but neither was it my worst. Other bloggers have reviewed Little Creatures Dining Hall and liked it just as much as I did: Juganaut’s Foodie Thoughts enjoyed a work dinner there and got to try a few more things than me; and Popcorn and Toast went recently and ordered different dishes again! LCDH seems to be able to be all things to all people. Recommend. Tags: aioli, brewery, cider, loud, pizza. Bookmark the permalink. Agree! I need one on the south side of the river.